An anti-extremism campaigner said he was “racially attacked” and hit in the face outside a theatre. 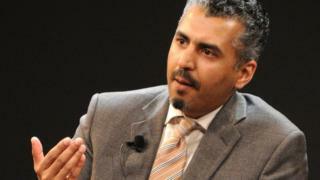 Maajid Nawaz said a white man attacked him while he was standing alone outside the Soho Theatre in central London. The LBC radio presenter tweeted a photo of a cut to his forehead and said he was racially abused and then hit in the face with “maybe a signet ring”. The Met Police said it was called to a report of a racially aggravated assault at 19:10 GMT. A spokesperson said the suspect had fled the scene in Dean Street before officers arrived. No arrests have been made and an investigation has been launched, the force added. Mr Nawaz, who presents a show on LBC radio on Saturday and Sunday lunchtimes, said his attacker took nothing and “ran away like a coward”. “My forehead will probably be scarred for life. But we will find you, you racist coward, and you will face British justice,” he added. He said there were witnesses “who heard the racial abuse and have given statements” and added that the police had his attacker’s “face on CCTV”. Mr Nawaz is the founder of the Quilliam Foundation, a counter-extremism organisation. In September, he said he had tracked down an anonymous “hero” who was stabbed and beaten for defending him from a racist mob in Southend 25 years ago. Mr Nawaz said he was 15 when he was confronted by a group of skinheads armed with hammers and knives, who then attacked a passer-by who intervened.